When Richard Oppelt arrived at Mayo Clinic's Rochester campus in early 2001, his lung capacity was minimal – only 21 percent of what it should have been. A sandblaster for 24 years, Richard, from Melbourne, Florida, had developed silicosis, a lung disease caused by breathing in silica dust, which can damage the lining of the lung air sacs, and cause scarring and stiffening of the lung, making it difficult to breathe. "When talking with someone, I would have to take a break to catch my breath," Richard says. "I was so short of breath sometimes that my wife had to finish my sentences. I also had a hard time making it up the stairs in my house without stopping several times." "His lungs were all scarred down and had all these huge deposits of silica. It's like having stones inside your lungs," says Cesar Keller, M.D., a transplant pulmonologist at Mayo Clinic's Florida campus. A lung transplant was Richard's best option. Unfortunately, during his nine-day visit to Rochester in January 2001, he learned there was a three-year wait. Four months later, Richard was hospitalized three times within 10 days and put on intravenous medication. His wife, Janice, called their insurance provider, desperate. "There is no way Richard will make it three years until a lung is found," she told them. She wanted options. 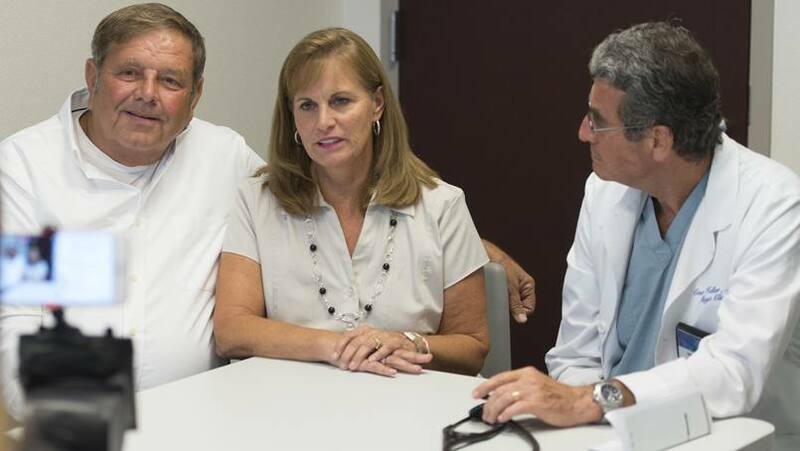 During that telephone call, Janice learned that Mayo Clinic's campus in Jacksonville, Florida – just 176 miles from their home – had recently launched a lung transplant program. Suddenly, Richard's outlook improved. And on June 7, 2001, Richard became the first lung transplant recipient on the Florida campus. "It was a wonderful miracle that we got a [donor] as fast as we did, because I don't think he could have waited much longer … he was down at the end of his lung function," says Dr. Keller. "I don't think Dr. Keller went home for several days," recalls Janice. "He was constantly in Richard's room. I think he spent 15 out of the first 24 hours of recovery in his room." For Richard, that presence was more than reassuring. "He is the most dedicated person I've ever known," Richard says. "He tells you what you have to do to get better. He has a way of getting you to trust him, because he tells you the truth. When he walks into the room I feel like 'I'm going to walk out of here' because Dr. Keller is here." Richard spent the next five weeks in intensive care. And while some of that is a blur, Richard says he'll always remember that first breath after his transplant. "All I could think of was, 'This is what breathing is like.' I couldn't believe how wonderful it felt to be able to breathe normally and to be able to talk without having to stop," he says. While a lung transplant can prolong a patient's life, the normal life expectancy for a lung transplant recipient is just 4.5 years. Richard has now surpassed that by more than 10 years, and he recently shared his experience during a Mayo Clinic Facebook Live event. "I wake up every morning happy to be alive," he says. "I appreciate life more than ever." Over the last 15 years the Oppelts have celebrated many milestones. "We've seen all three of our kids graduate from college and get married. We also celebrated our 40th anniversary last year," says Richard, who has eight grandchildren, ages 4 to 11. Over that same period, the team at Mayo's Gary and Dianne McCalla Transplant Center, has performed more than 500 lung transplants. Richard has also been able to get back to many of the things he loves most, such as going to the movies, taking walks on the beach, and traveling. Since his transplant, the Oppelts have been to many destinations including the Bahamas, Mexico, Aruba, New York and Las Vegas. As he approaches his 64th birthday, Richard says he wishes he could personally thank the donor and the donor's family. "He didn't just save me. He saved four other people. I couldn't thank his family enough," Richard says. "It's important for people to know that most people can't save a life, but a donor can save your life." Richard continues to take anti-rejection medication and looks forward to making new memories each day. "I'm looking forward to many more years. But I'm a realist. I know eventually I'll lose the battle," he says. "Even if I had not made it one year, I would have no regrets, because the alternative was so much worse." Learn more about lung transplantation at Mayo Clinic. Explore the Gary and Dianne McCalla Transplant Center at Mayo Clinic. Connect with others talking about living with a lung transplant on Mayo Clinic Connect.